As soon as you open an Easiglaze sliding door - whether it's a straight slide or a tilt-and-slide system - you know you're dealing with quality. The solid feel of the frame and the effortless ease with which it glides open make that instantly clear. But you may have to wait for a chilly autumn evening before you fully appreciate how its superb insulation - which minimises heat loss and cuts down external noise - can leave you feeling so snug and warm. And with the option of a multi-point locking system to give excellent burglar resistance, you can feel totally secure at the same time. What's the best way to bring a house to life? The answer is simple: Flood it with light. Which is exactly what a Easiglaze panoramic sliding door allows you to do. A completely concealed outer frame means an exceptionally large area of glass and an uncluttered view to the outside. The system has been designed to accommodate very wide spans so, concealed within the sill profile of each door leaf, are hard-wearing, integral rollers; these allow these leaves to run very easily, despite their large size. A low-noise motorised version is also available. With access made particularly safe by a threshold, which lies completely flus, these beautiful sliding doors are as functional as they are stylish. Everyone loves being in the open air when the sun shines. And when you install one of Easiglaze's folding doors - which allow a clear opening of as much as 95% - you can enjoy that sensation inside as well as outside your home, all day long. It's a fabulous, liberating feeling. Which is reinforced by the design options available: you can specify not only the colour (and there are plenty to choose from), but also whether the leaves glide inwards or outwards to stack. 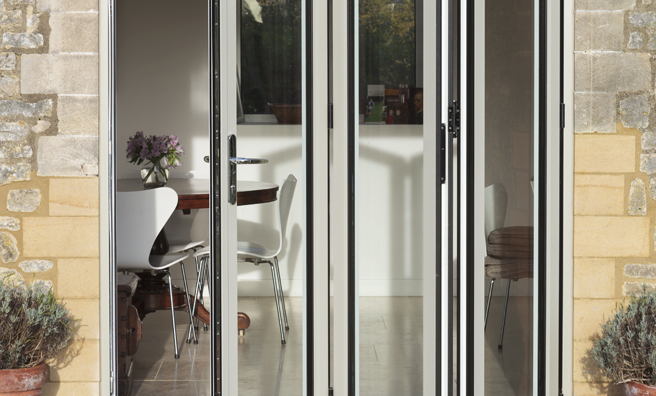 Every folding door is thermally insulated with close-fitting, weather-tight gaskets to eliminate draughts. Precision-made rollers and a top guide mean that even a door system with multiple leaves is easy to operate. In addition, being high engineered, a Easiglaze folding door is exceptionally strong and dependably secure despite elegantly slim frames and narrow face-widths.